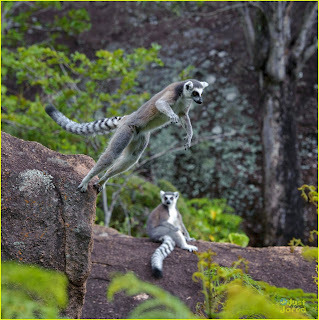 The early lemurs managed to survive the destruction of the asteroid that killed off the dinosaurs. Somehow some managed perhaps via a tree raft to sail across the ocean that separates the Island of Madagascar from Southern Africa. Those survivors arrived where there were no predators to prey upon them and thrived evolving into a wide variety of sizes and types. They eventually went extinct on the major continent, and now only on Madagascar. This nature documentary by David Douglas and written by Drew Fellman features some amazing footage of the beautiful landscape of Madagascar and close ups of the visually pleasing lemurs. Morgan Freeman's melodious voice narrates and gives life to the colorful critters. Their bodies have long tails that gives them leverage for jumping from tree to tree, even hopping on two legs on the ground. Dr. Patricia Wright has been studying lemurs for many years. Her work has been essential in the establishing part of the forest as a national park to preserve the lemur habitat. Humans on the island have been encroaching on their spaces by their need for farming and cattle land. To clear the fields they burn parts of the forest. Unfortunately the burns get our of control and destroy more than they should. The lemurs are forced to adapt to different locations. Dr. Wright spent many months tracking down Bamboo Lemurs who thought to be extinct. Lemurs which were once the size of big apes are considered sacred on Madagascar. Lemurs also do not survive captivity. They live in extended family units ruled by the alpha females of their groups who decide where they live and what they eat. The mouse lemur is the smallest primate in the world. The Bamboo Lemurs eat the young shoots of bamboo trees. One type of lemurs don't drink water getting their liquid from plants. Dr. Wright who was once a social worker before becoming a scientist uses her skill to work with the island inhabitants in bringing awareness of the lemurs and established a study center. Volunteers are able to rescue lemurs displaced by the burning of their lands and integrate them with other family units. This is a short but informative and interesting doc for all ages that seems to be aimed for television, school rooms or zoo presentations. The photography is spectacular and travelogue worthy. And the lemurs are too cute for school.